“The Broken Code” lived down to the worst fears of those who have preemptively criticized the format of How I Met Your Mother’s final season. The worry seemed to be that one weekend stretched out into 24 episodes would leave room for plenty of filler. This episode falters because it seems paper-thin, attempting to eek out just a tad of forward momentum in the Ted/Robin relationship, while giving an emotional resonance to Robin and Lily’s friendship, potentially for the last time. Neither of these stories are all that funny or, worse, poignant in any real way. I understand the impulse to give every friendship, romance and running joke a chance to shine in the final season, as this is the last time we’ll likely see an emphasis on, say, the bond between Lily and Robin. It’s not a terrible way to construct a farewell season, especially for a hangout sitcom such as this. The problem is mostly in execution, as the characters and show fret over issues that don’t matter. This is a much bigger problem when we know how little time we have left in this universe. Lily is concerned that Robin doesn’t have any female friends after a bachelorette party consists of only the two sitting alone in a rented-out McLaren’s (until Patrice arrives and Robin yells in anguish, a joke that Cobie Smulders keeps trying her best to sell but suffers from diminishing results at this point). Robin spends much of the episode giving her various reasons for hating much of the female gender until she hits it off with a fellow hockey fan. Lily, jealous, lashes out at the potential new buddy. Out of all the possible outcomes of this story, the one they chose is the least interesting, and makes no emotional sense. This plot was built around Robin, and her troubles with women. To end on a note of Lily’s craziness proving that Robin doesn’t need any other female friends makes no sense with the material that preceded it. The show could have built a solid story out of one of these two threads, but lumping them together takes the wind out the final scene. Barney and Ted’s half of the episode doesn’t fare much better. 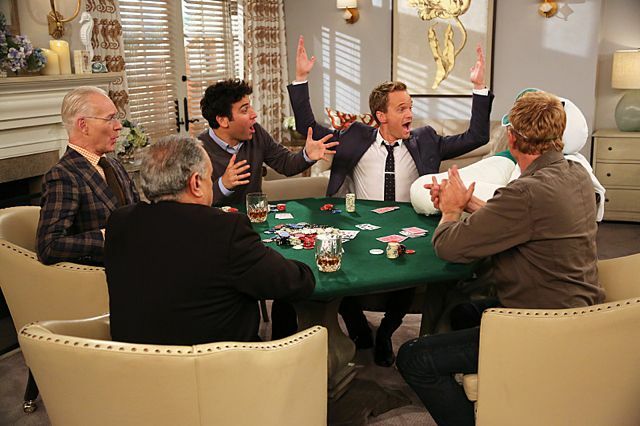 It turns out that Barney saw Ted hold Robin’s hand outside the carousel at the end of last season, so the groom-to-be forces his best man to complete an increasingly ridiculous series of tasks, before taking the best man crown (or poker visor) and giving it to Karate Kid hero William Zabka. Barney and Ted, with the aid of a skyping-in Marshall, resolve their issues on the beach, with Ted admitting he still has feelings for Robin but would never act on them. It is nice that the show decided to go with honesty here, rather than having Ted further obfuscate his true feelings from Barney, but it’s still just a part of the inevitable drama to come (inevitable not just from guessing; remember the reveal that Ted did go to California to get Robin’s locket, though, I suppose, this may be the show pulling one over on us). This does work better than Robin and Lily’s story because the issue did feel somewhat important, but the ending felt a little too neat. Then we got a joke about Ranjit and iPad Marshpillow playing poker and the tail end of the episode fizzled out. I’m by no means worried about the season as a whole after only one dud of an episode. I will, however, grow concerned if this becomes a trend. I understand that it’s somewhat ludicrous to ask a sitcom in its ninth season to be as funny as it once was, and that’s not what I’m doing (and I did laugh a handful of times tonight). Rather, I hope the show pulls back to the authenticity it put on full display at the end of the last two episodes. Nothing so far this season has come close to the magic of the future/present melding at the end of “Coming Back”, but I have faith that the show has plenty of great left in it. The reason “The Broken Code” doesn’t work is because it’s a lightweight and inconsequential episode of a show that knows how to push emotional buttons much better than this. But even though the “weekend stretched to a season” naysayers are still out there, I don’t believe tonight’s episode is endemic of a larger problem. Rather, it’s the kind of episode that we’ll skip over when it comes on in syndication and instead find a great entry that proves what this show can truly be. I do believe there are more examples of that to come. “Ted didn’t go to his prom? Classic.” – Even though the time delay gag was done much better on a recent Comedy Bang! Bang!, Jason Segel still made this line kick. “I’ve never played poker before. It looks like a hoot!” – Tim Gunn, who is just delightful. “Freshly penned table cards in a pretty decent chancery, considering I only had my travel quills.” – I’ve said it before and I’ll say it again. Douche Ted is the best.